Imagine it—clear skies. Chirping birds. Someone feeding you grapes and fanning your bronzed bo... maybe don’t look outside. This is imagination time. But soon (soon), these things will be happening, and all will be right in the world, and you will unleash these five items. 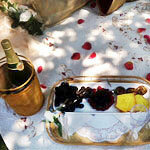 For it is picnic season. Working under the assumption that you’ve got no more than two arms, you’ll need some help with transporting supplies. 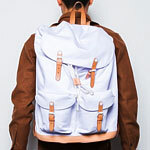 Something suspiciously backpack-like made with heavy canvas and multiple exterior pockets. We’ll call them sandwich pockets. Anything could go inside them. After arriving, you’ll want to spread everything out. But you’re not an animal, so here’s a blanket. 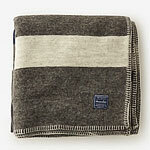 It’s made from lightweight hand-sewn wool, and it was inspired by military blankets used over the last 100 years. Pretty sure that makes it qualified to handle your picnic demands. Everyone knows that if you’re going to mix drinks at your own picnic bar, you’ve got to have the appropriate barware. 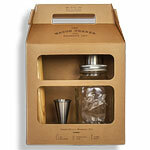 Here’s a muddler, jigger and shaker attached to a mason jar that should work swimmingly. Mason jars are synonymous with parks. You came to relax, not to run around everywhere and roll down hills (fine, maybe if there’s time). 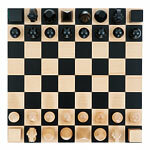 Luckily, Sid Mashburn has a solid beechwood chess set that’ll help facilitate that desire. Bonus: it looks really cool. Unless you say something like “King me,” then you’ve ruined everything. Maybe you’re not good at planning (you are). Maybe you’re also really busy (you are). Call these guys, arrive at the park of your choosing, and they’ll have everything already laid out, from platters of chocolate-covered strawberries to cake to pillows to scattered rose petals. Never scatter your own petals.